I suppose the disciples who couldn’t see her smelled it first. Their noses first caught just a hint of the scent, but then it surrounded them. The were enveloped in the sweet earthiness, full and ripe; the smell of nard. They craned their necks to get a glimpse of what was going on. Those who could smell and see saw a wild scene. They saw her, Mary, Lazarus’ sister, on the floor in front of Jesus. She took off the cloth, uncovering her head. She took off the top of the jar, uncovering the ointment. 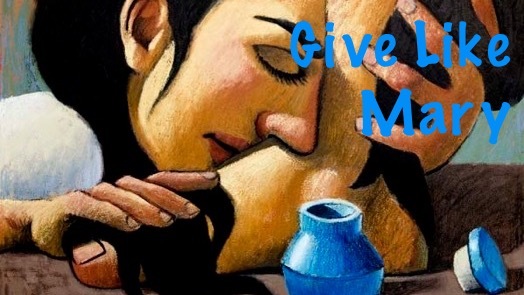 Veiled by her dark tresses serving as the towel, Mary’s hands caressed his feet with the perfume, feet that had just come over the mountains from Galilee, with their little cuts and sores and dust and dirt. This thing she did was vulnerable, and humble, and intimate, and tender. And weird. Mary had to feel their eyes upon her, don’t you think? She had to know they were all watching her. But Jesus was watching her too. “To hell what anyone else thinks,” she thought. “This man raised my brother from the dead. Martha’s serving dinner; I’m serving him like this.” A extravagant gift of touch and smell, and a costly gift of money. Because the poor didn’t raise my brother from the dead, you idiot. The poor didn’t conquer every fear in my heart. The poor didn’t bring joy out of the very grave called despair. The poor aren’t the Son of God come into the world, the Word made flesh, the Son of David, the King of Kings, the Lord of Lords, the King of the Jews, the Holy one of Israel, the Messiah. That’s why, Judas. Stinky-footed jerk. Well. She doesn’t actually say all that. But there’s a reason Judas’ question interrupts this scene like a fart on Good Friday. It’s not right; he’s misunderstood something. And it’s a “waste” because when the Bible says this ointment was costly, it’s not kidding. A denarii is a day’s wage, so subtracting out the sabbaths. 300 denarii is a year’s wages for a laborer. So…like $30,000. Mary rubbed a nicely equipped Toyota Camry on Jesus’ feet. And even assuming she didn’t use the whole thing (maybe just the front half of a Camry) — still, that’s a lot. And more than that…what’s the long term benefit here? It’s not going to last. It’s going to rub off. Jesus’ feet are going to get dirty again; some fool is going to have let his dog poop on the path without scooping. And in a week those feet are going to have a nail rammed through them anyway, though not everybody knows that yet. So there are a lot of reasons this could seem like a waste. What did Judas, or maybe all the guys, get wrong, that Mary, the woman, get right? Well, Judas was converting Mary’s gift with elementary school multiplication; Mary was doing a far more profound conversion. Judas’ math is really easy; we’ll practice it here in a second. But I bet you know something of Mary’s math too. There are some things we do in this life; some things we give, simply because we love. Mary didn’t do this for any pragmatic reason. She didn’t calculate an expected return on investment; she didn’t make Jesus fill out a grant application first; she didn’t do it for anyone else except the Lord. She opened this jar of terribly expensive ointment, rubbed it into his feet, and wiped them with her hair, because she loved the Lord that much. Oh that we would all love the Lord that much. The thing about an extravagant, unnecessary, gift of the best you have is that it transmutes money into love. A gift…be it nard ointment, or an engagement ring, or a Christmas present for your grandchild, or a gift to Christ’s Church…a gift is a way for us to take material goods and use them to express something immaterial. Gifts allow us to spend money to express love. Of course, money can’t make up for a lack of love; gifts can’t buy love; but provided the love is there, the gift is a vehicle of its expression. Our human state is that we need to give and receive gifts; we embodied souls are a strange mixture of body and spirit, we need the material world to express what cannot be touched — our love, our devotion, and affection. God doesn’t command generosity for his sake; God doesn’t need our stuff. God commands generosity for our sake. That to which we give is that which we love. Judas’ grave lack was that he recognized only the material value of things; he could only convert ointment into denarii and denarii into food. Anybody can do that; it’s elementary. Let’s try it. Have you ever spent a whole lot of money on someone because you love them very much? That’s a pretty general question. How about this, guys, those of you are married, have you ever bought anything for your wife, and expensive thing she’s wearing, maybe on a finger on her left hand, with a stone in it. Let’s do some Judas math. I’ll present it as word problem. How much is that ring worth? Ok; the North Texas Food Bank can provide 3 meals for every $1 donated. So multiply by 3. How many meals is that? Or divide that by a 1000 or so, and that’s roughly how many human beings that ring could feed for a year. “Did you get that ring because you don’t like poor people?” asks Judas. No, you got that ring because you love that woman; because that gift, expensive though it was, expressed that love. This is Mary’s math. Caring for poor people and loving your spouse, these are not equivalent goods. They are both goods; but they can’t be exchanged freely, one with another. I acknowledge of course that loving Jesus is different than loving your spouse. For one of the ways we love God is to love our neighbor; to take care of the poor in our midst. Judas is, of course, correct that giving 300 denarii to the poor is a good thing; even a Godly thing. I have no dispute with that. Where he’s wrong is that the good of giving to the poor makes Mary’s gift to Jesus a bad thing. Giving to the poor is not the only good thing. Gifts that care for poor people and gifts that extravagantly show our love for Jesus are not actually equivalent goods either. What I do believe is true, just form my experience as a priest, is that almost without exception these things — generous gifts to Jesus as an expression of love and devotion (like Mary) and generous gifts to the poor (like Judas claims to believe in) — they tend to go hand-in-hand. I know a lot of Mary’s; they give a lot to the poor. If you look at the names engraved on things here at St. Andrew’s, or the names of people at the top of our giving pyramid, you would not find that they’re all the wealthiest people. But what you would find is that they’re the same group of people who have started non-profits, care about our outreach, underwrote the BlessMobile. The same people who made sure, by their gifts to the church, that we don’t celebrate the sacrament of the Lord’s body and blood with a solo cup are the same people who make sure that we have plenty of solo cups full of lemonade to hand to our thirsty brothers and sisters when we gather with them for lunch. The same people who, like Mary, believe Jesus deserves nice things, tend to believe that the poor deserve food. Jesus does not mean, “The poor will be there no matter what, so why bother trying to help them.” Don’t let anybody tell you that. But what Jesus does mean is that our opportunity to care for our fellow human beings is inexhaustible. There’s no way we fill all the needs of one another; and so if we decide we’re not going to love on Jesus until we’ve ended pain and suffering — world first and Jesus second — then we’ll never get to Jesus. He’ll be gone from our lives, and we’ll be gone from this life. We don’t know how Mary served the poor; but we do know she had a lifetime of opportunities? But this chance to anoint him, she only has it once. If she’d waited even just one week...well, in the gospels, one week from this day, Jesus is in a tomb. After all, Jesus said this ointment anointing was for his burial. And if it’s for his burial, it’s for his rising to life again. The gifts we give to Jesus don’t die, they come back to life as new things. Here in the church, the gifts we give to Jesus come back as chalices that bear his blood and candlesticks that bear his light and buildings and music and prayers and pastoral conversations and tears and hope and lives transformed. Judas stayed on the material plane. He would have fit right in our culture today. But Mary could cross planes with her gift, from the material to the spiritual. Mary could convert ointment into love. That’s the very best kind of gift; the kind that gets us beyond ourselves, beyond the world of stuff at all, and closer to the love that made us, shapes us, and draws us close. So let us find our own jar of nard, whatever that may be, and give it to Jesus.